This Boxed set contains all ten books that comprise Knights and Demons. 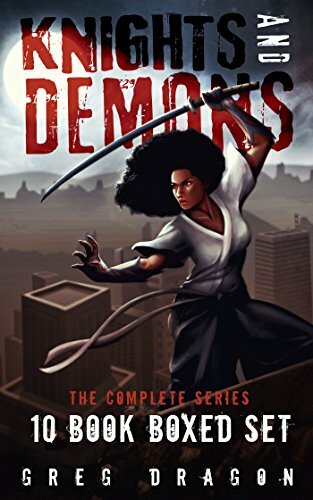 Knights and Demons is an urban fantasy, action/adventure, about one woman's struggle to save a world besieged by demons. Each book within this series is 80-100 pages. Years of martial arts training never prepared nineteen-year-old Alysia Knight for the battle she has to face. War is raging in the streets of New Jersey, and surviving the apocalypse means staying clear of monsters preying on the citizens. As a teen, Alysia never dreamed her first years as an adult would be spent fighting demons. However, as the chosen warrior of the Turevila, she must defeat them in order to save the world. This book and all of its details (links, price, title, cover and description) are provided to you as is, by its author. One Stop Fiction cannot be held accountable for any changes to the published price. Please check this before purchasing. Report this book here if something's wrong. What's wrong with this book? Greg Dragon brings a fresh perspective to fiction by telling human stories of life, love, and relationships in a science fiction setting. This unconventional author spins his celestial scenes from an imagination nurtured from being an avid reader himself. His exposure to multiple cultures, religions, martial arts and travel lends a unique dynamic to his stories. You can enjoy excerpts from his work by visiting his website at https://gregdragon.com.